When she joined the startup operation in 1983, Dace Viceps Madore ’69 was the third—maybe the fourth—person on the payroll of Rochester-based Praxis Biologics, a company launched by three Medical Center scientists to commercialize a new approach to developing vaccines for children. 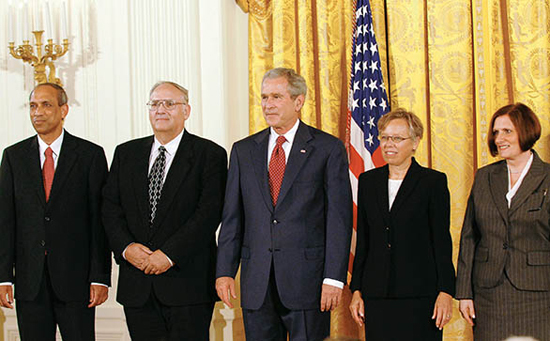 TECHNOLOGY TEAM: Dace Viceps Madore ’69 (second from right) and Maya Koster ’83 (right) are joined by colleagues Veluplillai Puvanesarajah and Ronald Eby as they receive the National Medal of Technology from President Bush during a White House ceremony this summer. The four were recognized as leaders of the Wyeth Pharmaceuticals team that developed the vaccine Prevnar. Based on technology developed at the University in the 1980s, Prevnar has been described as the single most important advance in pediatric medicine in the last decade. The company—launched by the late David Smith along with Rochester scientists Porter Anderson and Richard Insel—was founded to commercialize what would become the Hib vaccine, the first vaccine to prevent infections in infants caused by the deadly Haemophilus influenza type b (Hib) bacteria. As they recognized the potential of their approach with the success of the Hib vaccine, the Rochester scientists turned their attention to Streptococcus. The family of bacteria was estimated to cause about 12,000 cases of bloodstream infections, meningitis, and other invasive diseases; about 53,000 cases of pneumonia; and about 1 million ear infections in U.S. children each year. By the time she retired a few years ago, Madore was a key figure in the development of Prevnar, the first pediatric vaccine to target Streptococcus. Based on University-developed technology licensed to Wyeth Pharmaceuticals, Prevnar—like its cousin the Hib vaccine—is credited with changing the landscape of pediatric medicine. “Upon reflection, working on this project was a unique opportunity,” Madore says. “Very few people have the opportunity to be involved in a project like this from its beginning, through its evolution, and to its end. Madore and fellow Rochester graduate Maya Koster ’83 received that recognition this summer when they were part of a four-person group from Wyeth presented with the National Medal of Technology, one of the nation’s highest honors for innovation. Administered by the U.S. Commerce Department, the medal recognizes innovators—as individuals, teams, or as companies—for their contributions to the nation’s economic, environmental, and social well-being through the development and commercialization of technology. Joining the Rochester alumni at a White House ceremony and reception were their fellow Wyeth team members Ronald Eby and Velupillai Puvanesarajah. While Koster, who helped design the chemistry behind the vaccine, and Madore, who headed a group that created the methods for evaluating the vaccine’s effectiveness, had vital roles in the development of Prevnar, they are both quick to point out that the four medal recipients are representatives of a much larger Wyeth effort. Prevnar traces its roots to Rochester where, in the early 1980s, Smith, Insel, and Anderson successfully demonstrated that by coupling a protein to a polysaccharide from specific types of bacteria, a vaccine could elicit an immune response in children, greatly reducing their susceptibility to infection. The Hib vaccine was the first to use such “conjugate” technology, and when pharmaceutical companies were originally skeptical of its potential, the three researchers founded Praxis. Since the FDA’s approval of the Hib vaccine in 1990, cases of illness caused by the bacteria have fallen from about 20,000 a year to fewer than 200, so low that most pediatricians no longer see infections caused by Hib during their careers. Although Prevnar targets a more complicated foe in Streptococcus pneumoniae, the Hib vaccine paved the way, Madore says, because the two are based on the same chemical approach. “The Hib vaccine was novel chemistry and a novel approach for eliciting an antibody response in an immature immune system,” Madore says. And Prevnar has shown similar effectiveness based on nationwide data that included the Monroe County of Health and the University: A 2003 study published in the New England Journal of Medicine indicated that infections caused by pneumococcal bacteria had been cut by 69 percent among children who received the vaccine. The study also showed that the rate of infection among adults also fell dramatically—even though they had not been immunized—because their children were less likely to be hosts for pneumococcus. A 2007 study in the journal Pediatrics showed that Prevnar has also reduced the incidence of ear infections—and the need for ear tubes among children with ear infections—since its introduction in 2000. In order to effectively fight pneumococcal-based infections, Koster says Prevnar combines seven different conjugates—in effect, seven different vaccines—into one inoculation. Researchers began by testing a vaccine with two conjugates but found that a seven-valent formulation would cover about 80 percent of Streptococcus pneumoniae infections. Koster, who joined Praxis in 1986, earned her bachelor’s degree in chemistry from the University after immigrating from Russia in the 1970s. Although she had a master’s degree when she arrived, she hoped that an American degree would boost her chances for finding work in her new country. “Like any immigrant, I wanted to find success, and I thought a degree would help,” she says. After working as a researcher at the Medical Center for a few years after graduation, she joined Praxis. Both Koster and Madore stayed with the research project as the ownership of Praxis evolved during the past two decades. In 1989, Praxis merged with the pharmaceutical company Lederle to become Lederle Praxis. In 1994, that company was bought by American Home Products, which was eventually merged into its parent Wyeth. Madore, who earned her degree in biology from Rochester, went on to earn a master’s and a Ph.D. at Temple University. She and her family returned to the Rochester area in 1982. She says that throughout all the corporate changes, each company recognized the potential of Prevnar and supported it. The National Institutes of Health also provided important funding. “Regardless of the mergers and the buyouts, this was one program that every manager recognized and supported,” she says. In 2003, Wyeth closed its Rochester facility, moving the home base for Prevnar out of the area for the first time since she began with the original team 20 years earlier.